The starting pitcher had recorded a grand total of one out in the first game of the 2017 MLB postseason when it seemed as if the playoff field's second best team was about to be bounced from competition. Nevertheless, the New York Yankees did what they were expected to do (and what they always seem to do to the Minnesota Twins), advancing to the American League Division series for the first time in five years. New York now heads to Cleveland to face a torrid Indians team that is favored 56-44% to reach the ALCS. Despite the Indians' favored status, the Yankees are still a healthy 6:1 bet to win their first World Series since 2009. The Tribe are in a better position, with odds around 3:1, but it's a slightly less favorable position (by about three percentage points) than yesterday when there was a 37% chance they might face the Twins instead. 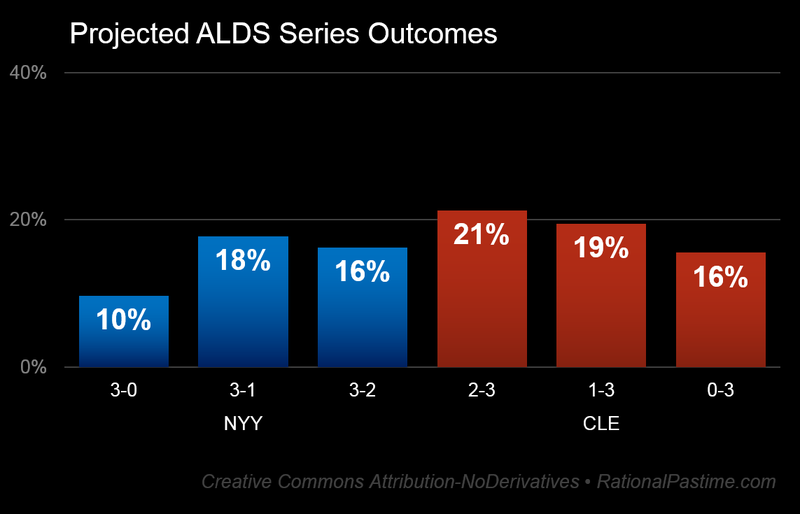 The most likely discrete outcomes of the upcoming NYY-CLE ALDS are Cleveland wins in four or five games. The Yankees' best chance is to bounce the Indians at home in game four. The winner of the above series will face the winner of the other American League matchup between the Boston Red Sox and the Houston Astros. RP has admittedly underestimated Boston's chances all year. 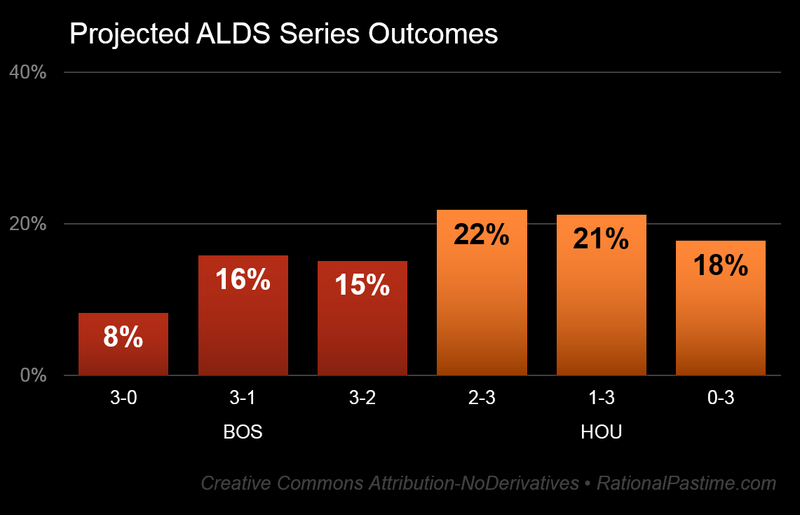 Regardless, the model projects Houston as a 61-39% favorite. Boston's best chance is a Red Sox victory in four games. 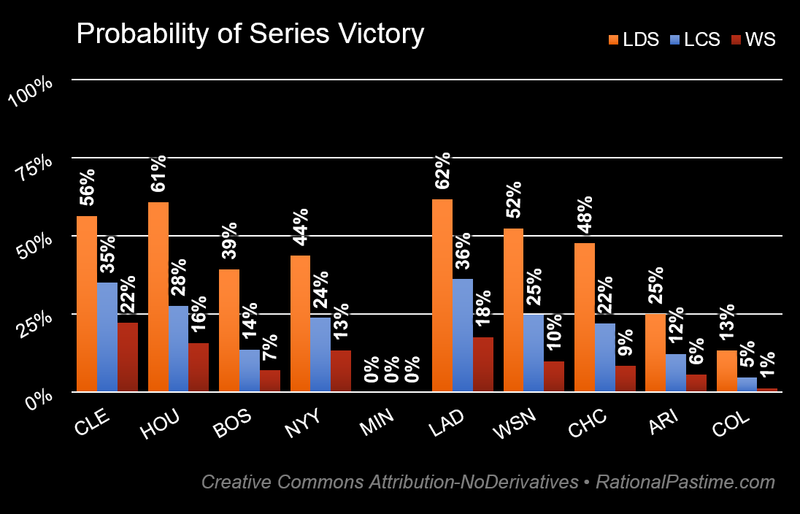 The most likely discrete World Series outcome remains a Cleveland win over the Los Angeles Dodgers in five games. Check in tomorrow to see how the results of the National League Wild Card Game affect the remaining eight team's hopes for October glory.